India is a land of surprise and there are many things on the roads and in your surroundings that may shock you. Here is one such thing which was spotted in Hyderabad. Since there is nothing like this on the Internet, we are calling it world’s first but if you are aware of any such job, please do let us know in the comments. 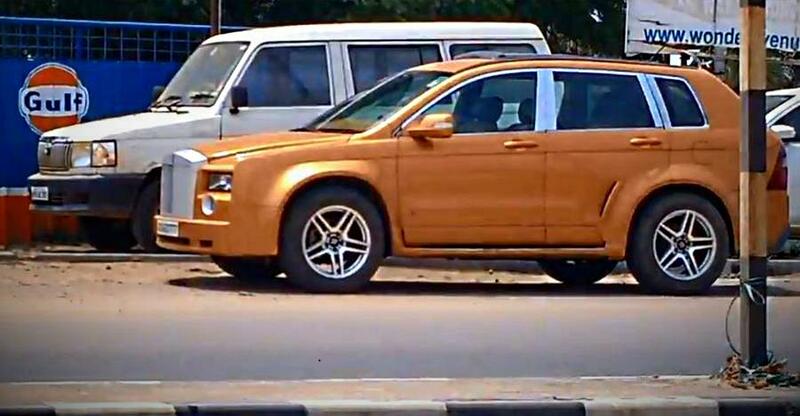 This vehicle was spotted by fayyazmas khan in Hyderabad and the modification job is clearly inspired by the design of Rolls Royce Cullinan, the first SUV from the British luxury car maker. The video is taken from the opposite side of the road but it quite clearly shows the replica job done in Hyderabad. It is not known who owns the car and how much cost or time has been spent on the transformation. The replica job of the Cullinan is based on the now-discontinued Chevrolet Captiva and the modder has done his best to bring the vehicle as close to the original model. But of course, it looks way different from the Cullinan in real life. The view of the side shows the window line of the replica Cullinan that gets a boundary of thick chrome stripe all around just like the original vehicle. However, the window line is all wrong and out of place. The vehicle also gets only regular doors and not the suicide doors available on the Cullinan. However, the modder has taken all the efforts to make the vehicle look as close to the Cullinan as possible. It even gets aftermarket alloy wheels. It is the front where most of the efforts can be seen. The whole front-end has been transformed to give it the Rolls Royce look. A new Rolls Royce grille has been added to the car but there is no ‘Spirit of Ecstasy’ on the bonnet. Even the headlamps have been given the rectangular shape similar to the Rolls Royce Cullinan and just below the main headlamps, round fog lamps have been placed. The bumper looks rather simple. While the price of this transformation job is not known but it must have taken a couple of lakhs to make the Chevrolet Captiva look like this. The Rolls Royce Cullinan is one of the most expensive cars in the Indian market and comes with a price tag of Rs 6.95 crore, ex-showroom, India. This makes the vehicle out of reach for the majority of the Indian population but such a transformation job is sure affordable enough for many who dream of such cars. This is not the first time that someone has tried to create a replica model in India. In the past, many have tried to copy the design of expensive luxury vehicles through modification jobs and have failed terribly. There is even a Lamborghini Sesto Elemento replica in India, which is based on a Lamborghini Gallardo LP560! There are only 20 units of Sesto Elemento in the world.